Plus all the usual retail movements, as you would expect. 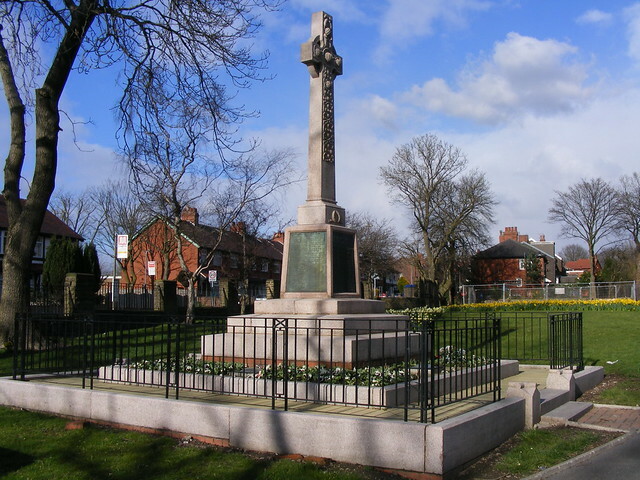 Remembrance Day, Sunday 11 November 2018: in just over a week’s time, the people of Tameside will be paying their respects to the fallen. As usual, parades will take place at most parts of the borough. Image of Hurst Cemetery memorial by Ian Roberts, 2008 (Creative Commons License: Attribution-Share Alike). In the last week we have heard about the Crawshaw Group going into administration. The butchery chain, which has branches in Northern England and the Midlands, recently expanded by adding Gabbot’s Farm to its portfolio. This September they agreed a deal with wholesale grocers Blakemore, adding Crawshaws products to Spar shops across the UK. Over the last two days, its Hyde and Ashton-under-Lyne branches were closed. Both stores were inherited from Gabbot’s Farm. The Hyde store was previously NORWEB Electricity showroom whereas Ashton’s branch had been in the Arcades Shopping Centre since 1997. Sticking with the Arcades Shopping Centre, it has been a great month for Magpie’s Nest. The accessories retailer with shops in Stalybridge and Ashton-under-Lyne won the Retailer of the Year Prize at the Pride Of Tameside Awards. To celebrate their success they had a sale. Since opening their first shop in Stalybridge in 2013, Magpie’s Nest has become one of Tameside’s finest independent retailers. It gives us great pleasure to find they are finalists in the 2018 Best Small Shop Competition. This competition is run by the Independent Retail Confederation and we wish them every success. In the last fortnight, we have seen the departure of J.W. Mettrick’s butchers from Stalybridge town centre. Thankfully, it is staying open as a butchers, as per the clause in its lease. Former Mettricks employee John Boult has taken on the Melbourne Street shop as Boult’s Butchers. In its newly independent guise, Boult’s Butchers have started selling pies by Bradley’s Bakery (King’s Road, Hurst). We wish him well in his endeavours and hope this is reciprocated locally. With 2018 being one hundred years since the end of the First World War, there has been a number of events planned in the borough. Under the banner of 11 Days of Remembrance, these include a Poetry Competition, a victory dance on Hyde Market Ground, and historical tributes. Stalybridge will see hidden toy soldiers whereas Denton and Dukinfield saw window silhouettes yesterday. Everything is covered in Tameside MBC’s flyer which is worth a peek. As per usual, Remembrance Day services and parades are planned for the weekend. With Remembrance Sunday falling on the 11 November this year, there is a good reason to pay your respects. Once again, Tameside MBC’s website is your guide. More cladding has been added, and it is anticipated that Son of TAC will be finished by the start of 2019. Saturday 17 November: Christmas lights switch-ons in Stalybridge (4.00pm to 6.00pm) and Droylsden (5.00pm). There will also be live entertainment in both towns and the usual festive themed refreshments. At 3.45pm, Droylsden’s switch-on will also have a community-led lantern parade. Friday 23 November: Christmas lights switch-ons in Audenshaw (Ryecroft Hall, 4.00pm – 7.00pm), Dukinfield (6.00pm – 6.35pm), and Micklehurst (6.00pm – 7.30pm). Saturday 24 November: Christmas Spectacular event in Ashton-under-Lyne (11.00am – 4.30pm), plus a switch-on in Hollingworth (Treacle Gardens, 3.15pm – 4.15pm) and the Mossley Lantern Parade (Market Place, 4.00pm – 7.00pm). Friday 30 November: Christmas lights switch-on in Hattersley (The Hub, Stockport Road, 4.00pm – 7.30pm) where boxer Marcus Morrison will putting the big light on for Christmas. Saturday 01 December: Christmas lights switch-on in Hyde (Market Square, 4.15pm) with entertainment, amusements and an artisan market. Flicking the big switch outside Hyde Town Hall will be another boxer: Stacey Copeland. The fun begins at 10.00am and lasts till 5.30pm. A Christmas Market with hot food, drinks, entertainment, and children’s fairground rides;(Saturday 08 December, 2.00pm – 4.00pm) Denton’s Got Talent; and,(Saturday 08 December, 6.00pm – 7.30pm) A lantern parade, plus Christmas lights, music, fireworks, and that big fat man with a long white beard (usually dressed in red). Further details are available on the Tameside MBC website. If you are going to any of the events or happen to be passing through, please allow more time for your journey. Please note that buses and other road traffic may be diverted. Even more so with there being further Northern rail strikes affecting Saturday’s events. As a mid-1980 British Telecom advert once said, “Chop chop, busy busy…” yes, quite a busy one over the last month. The She-VIP nail bar on 68 Manchester Road, Denton could see a first floor infill extension and internal remodelling. A doggy daycare centre could be coming to Dukinfield. Unit 1 of Vale Industrial Estate, Furnace Street could see a change from an industrial unit to canine condominium. The Co-op has applied for planning permission for the addition of illuminated signage on their forthcoming Audenshaw store. A retrospective planning permission request has been put in for part of the Thornley Street works off Dowson Road, Hyde. This could be converted from storage to retail by AI Construction. Part of the former Rhino Design offices on Stamford Street, Ashton-under-Lyne, could see a change of use from offices and retail to eight apartments. The ground floor will still see continued use as office space. On Higham Lane near Werneth Low, Hyde, Holy Trinity Church Hall could be converted into a detached house. Complementing the refurbishment of Dukinfield’s Morrisons store, the superstore’s petrol station could see a change of road layout with the widening of part of its exit from Sandy Lane. The Theatre Royal on Corporation Street, Hyde, now in use as the Masjid At Tawheed Hyde Islamic Resource Centre, could see the restoration of its canopy at the front entrance. There will also be some changes to the auditorium and stage. Offices on 53 – 55 Stockport Road, Denton could become a House of Multiple Occupation. The former Stalybridge Industrial Cooperative Society store on 2 Huddersfield Road, Stalybridge, could see a change of use on its ground floor from Assembly and Leisure uses to Financial Services. The Accountancy People who own the building would like to extend its existing business on the ground floor and convert its first and second floors to apartments. Denton Methodist Church on Hyde Road could see the addition of a single storey extension. If approved, this will be used as a new entrance to the church and a coffee shop. Building work is under way on the site of Stalybridge’s former public toilets. Kitchen and Co on Armentieres Square, Stalybridge has seen the installation of new management and a fresh new menu. The former Stamford Cinema/Smith Knight Fay car showroom/Tile Giant unit in Audenshaw is in the midst of its conversion into a Co-op convenience store. In the 2019 CAMRA Good Beer Guide, it gives us great pleasure to announce The Angel’s addition to this hallowed tome. Over the last five years, the Dukinfield pub has impressed regulars and occasional visitors with its cask conditioned ales. Many of which are priced at under £3.00 a pint. If you fancy a good pint in the bottom end of Duki, it is a short 330 or 41 bus ride away from Ashton-under-Lyne. In other news, both our borough’s ‘Spoons houses are in too (in case you have forgotten, that’s The Ash Tree and The Society Rooms). Not so good news concerns the possible depubification of the Dog and Partridge on Mottram Road, Stalybridge. A preliminary risk assessment has been commissioned by the owner to check for soil contamination and subsidence. Whilst on the subject of depubification, the Cambridge Inn in Ashton’s West End could be converted into six apartments. The Pig on the Wall on Greenside Lane, Droylsden, could see improved facilities for smokers. Plans have been submitted for the addition of a smoking shelter in its beer garden. Elsewhere in the same place, the ground floor of The Gardeners Arms on 279 Edge Lane could see depubification in the form of a large House of Multiple Occupation. Not a million miles away from Droylsden, a detached timber outbuilding could be added to The Snipe Inn in Audenshaw. Our next Ashton Review of Shops will be out on the 01 December 2018. Will there be some good retail news under the (threadbare) Christmas tree? Tune it to next month’s exciting, same Ashton Bat time, same Ashton Bat channel. Which is 9am of course.